This year, the Lexington Goes Purple team, in partnership with the Lexington Human Services Department, the Munroe Center for the Arts, and Cary Memorial Library will run a series of Longest Day events on Saturday, June 9 from 9:00 AM - 5:00 PM centered at the Lexington Depot. 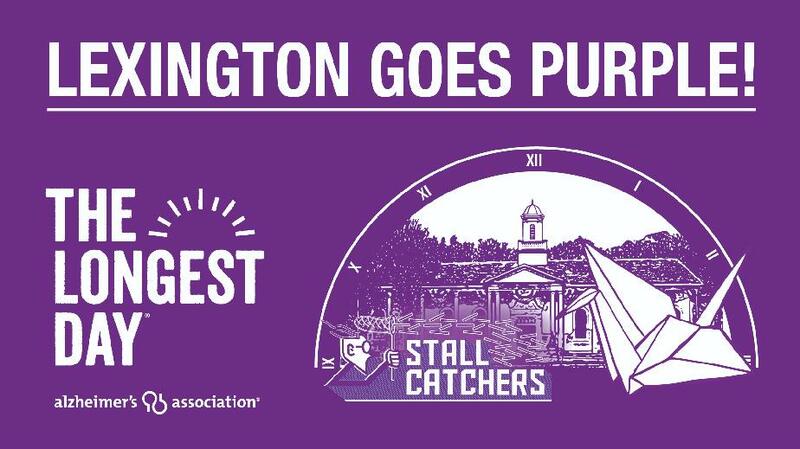 9:30 am - 10:30 am: Dress your favorite pooch in purple and join the Purple Puppy Promenade at the Lexington Depot. In exchange for a donation of any amount, get an official Alzheimer's Association bandana. Register at the Sign Up Genius above. 10:00 am to noon: Guided Walk with Lexington Conservation (CLC) through Lincoln Park, one of Lexington’s most accessible open spaces. Centrally located across Worthen Road from the LHS playing fields, Lincoln Park includes a graded trail system, landscaped with native plant species as well as a boardwalk loop through wetlands with interpretive signage. The walk will leave from the Lexington Depot following side streets to reach the Park. 1:00pm - 2:00pm: Enjoy live classical music from the Lexington Chamber Music Center. 2:00pm - 3:00pm: Sing-a-long and storytelling with Rose Harvey and Lin Kelleher. All day: Fold a paper crane with the LHS Origami Club at the Lexington Depot - 1,000 cranes will help our wish for a World Without Alzheimer’s come true. All day: Participate in Citizen Science research by playing Stall Catchers on your smartphone or mobile device. All day: Learn about services and support for patients and caregivers from local providers. All day: Share memories at the "My Favorite Memory Is..." photo salon. 4:00pm: Celebrate with purple ice cream.